Basilar consolidation is a pathologic disease process that takes place with certain types of lung infections. Consolidation can block air flow through your lungs, causing you to feel short of breath or fatigued. While consolidation alone is rarely a life-threatening condition, severe complications may arise if it is left untreated. “Basilar” refers to the base, or bottom, of your lungs. Your right lung consists of three lobes: the upper, middle and lower. Because your heart is located on the left side of your body, leaving less lung space in your chest cavity, your left lung consists only of an upper and a lower lobe. With respect to your lungs, the term “basilar” consolidation means consolidation in one or both lower lobes. 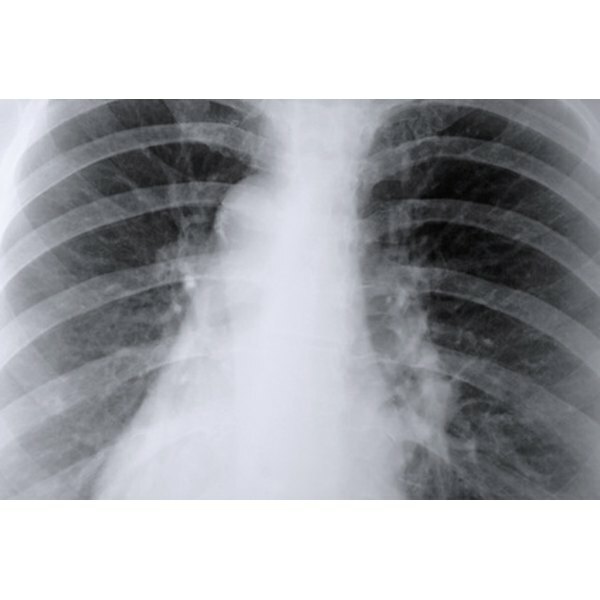 Although it is a general term referring to the accumulation of any foreign substance, "consolidation of the lungs" most commonly means a bacterial infection, or pneumonia, is present. A consolidated area contains thick, viscous fluid made up of bacteria, white blood cells and other debris. In his book, "Rapid Review Pathology," Dr. Edward Goljan, M.D., classifies bacterial pneumonia in two distinct categories: bronchopneumonia, with patchy areas of consolidation throughout one or more lobes, and lobar pneumonia, which is consolidation that fills an entire lobe. While consolidation can form in any area of your lungs, the most common location is the lower lobes. Inhaled oxygen travels through a network of branching airways until it reaches tiny air pockets called alveoli, which is where oxygen exchange takes place between your lungs and blood. When you are upright, gravity directs more of your inhaled air to the base of your lungs than to the tops of your lungs. Lobar pneumonia therefore usually settles in your lower lobes. There your body’s natural defense mechanism, neutrophils (a type of white blood cell), along with other inflammatory cells, attacks the bacterium, causing consolidation. According to the U.S. National Library of Medicine and the National Institutes of Health, bacterial lung infections are the most common causes of pneumonia. In adults, Streptococcus pneumoniae is the most common cause of bacterial pneumonia. S. pneumoniae can be spread from person to person by tiny air droplets, in the same manner that seasonal flu spreads. Common symptoms associated with bacterial pneumonia include high fever, chills and a productive cough, that is, a cough that brings up fluid from the lungs. Physicians use a variety of methods to identify the presence of basilar consolidation. Two of those methods are listening to breath sounds through a stethoscope and tapping on your rib cage. The need for hospitalization depends on the severity of your illness and your general health otherwise. Your physician will begin an antibiotic course immediately, followed by an adjusted course of treatment if the laboratory results deem it necessary. Residing in Washington, D.C., Tai Sumner has been writing health & fitness and medical-related articles since 1990. Her writing is founded upon 15 years of team sports and personal training experience. Sumner is currently completing a Medical Doctor degree and a Master of Health degree in Emergency & Disaster Management.